Hot pot is the name of the game and freshwater crab is the star for today’s meal. The stock is made from beef ribs, freshwater crabs, other shellfish, tomatoes, green onions, and other seasonings. An order of this dish comes with a humongous platter of toppings for you to sweeten your soup with. 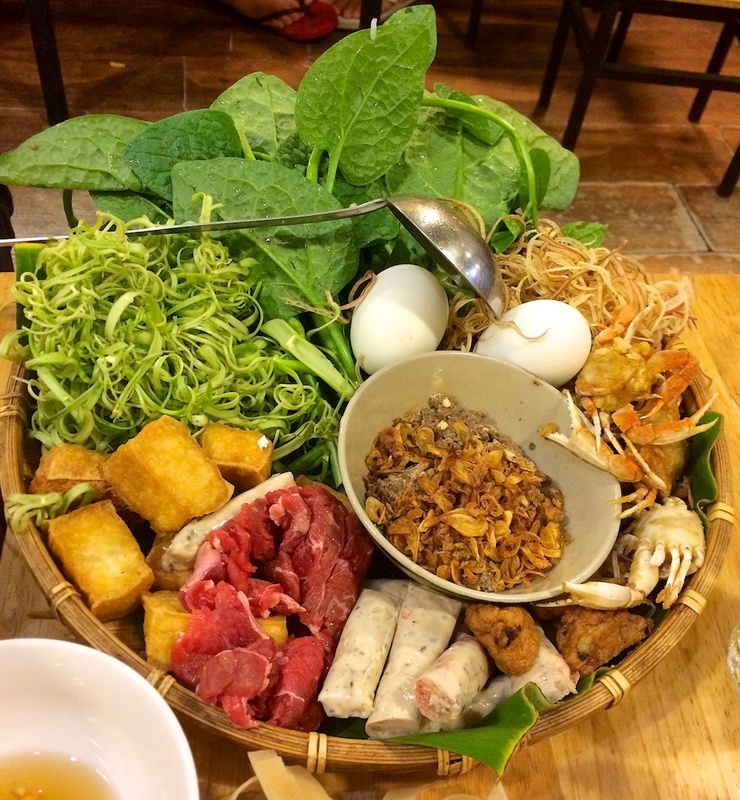 Toppings like tofu, pork patties, beef flanks, crabs, vegetables, and a bowl of freshwater crabs paste. It also comes with 2 Trứng Vịt Lộn (duck embryo), but you don’t have to put it in your soup. However, if you want to eat it like the locals and feeling adventurous, you can crack it into the soup to cook. At first, we thought these were regular eggs so we placed it into the soup to boil, but by the time we realized it was meant to be cracked into the soup for extra seasoning, it was too late. 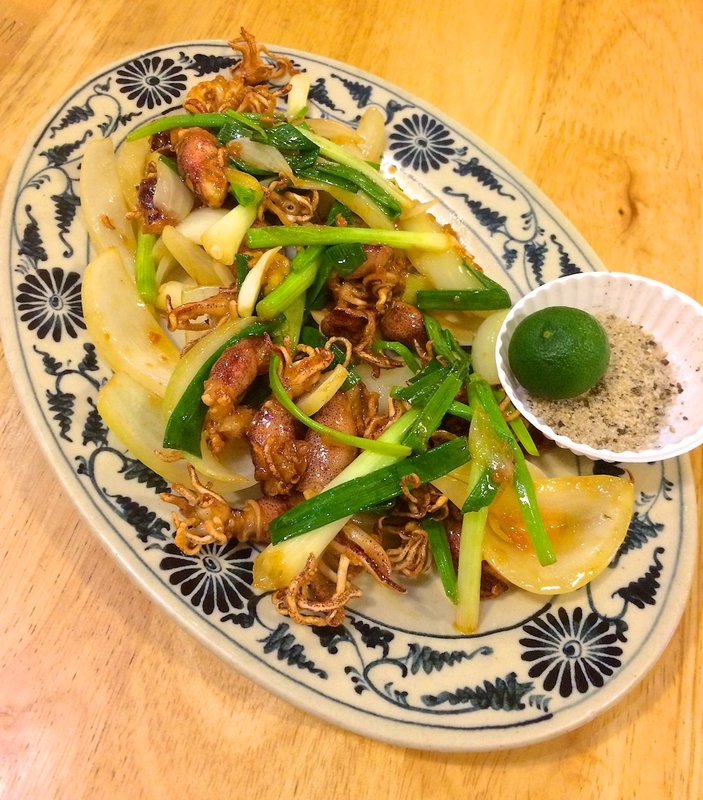 Try an appetizer of Mực Sữa Chiên Nước Mắm (pan-fried baby squids in sweet and tangy fish sauce) cooked with onions and green onions. Squeeze the kumquat in the salt and pepper mixture and dip these tender babies in before enjoying them. It’s salty, sweet, and citrusy. 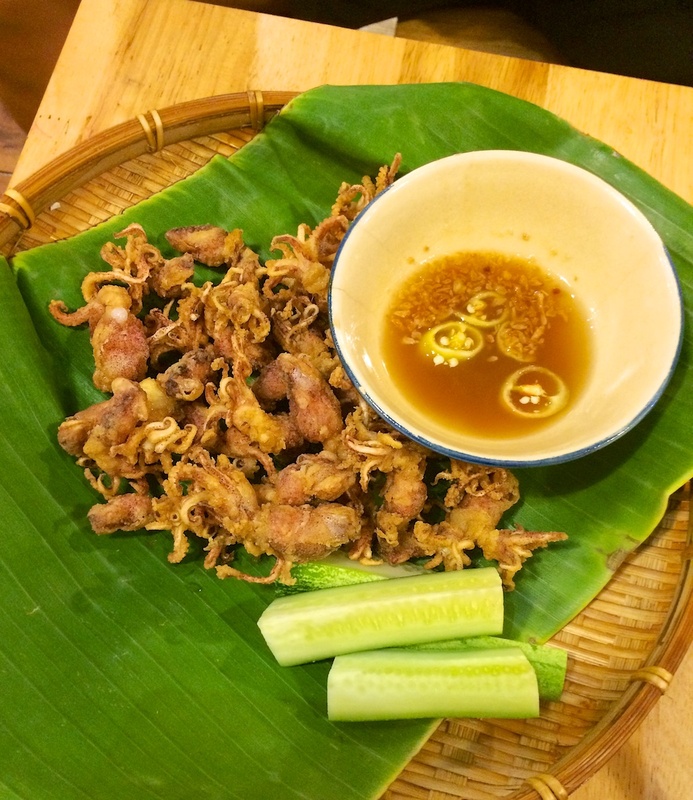 We tried another version of the baby squid, but this time it was the Mực Sữa Chiên Mắm Me (deep-fried baby squids with tamarind sauce). The squids are crunchy while the tamarind sauce is sweet and sour. Both versions were delicious, but we ended up liking the pan-fried version a little bit more. If you have more people in your group, do try other dishes. We couldn’t try many other dishes because it was just myself and another person.